I don’t know if when Ice Cube rapped that he’d had a good day, he was secretly thinking about an interstate in Vermont in mid-September, but as of today, I have my suspicions. Because today’s road trip was spectacular. Twelve hours door-to-door, just Lindsey and I, and every minute of it sped by the way the best times do because they are bastards and life hates when we are enjoying it. The morning started chilly and foggy. Perfect is the synonym for that. We found ourselves at our first stop in no time: The town of Royalton, Vermont, to see the more than century-old obelisk marking the tiny piece of Vermont where Joseph Smith, founder of the Church of Jesus Christ of Latter-day Saints, was born. That’s right. The O.G. Mormon was a New Englander. As was, by the way, Mary Baker Eddy, founder of Christian Science, and Jesus H. Christ, founder of Aerosmith. I at some point started collecting Mormon sites because that organization’s story fascinates me and because those cats are really good at preserving sites. I’ve been trying to get to this particular one for a while. To the point that we did something here we rarely do. We let the Elder running the place talk to us for an hour about the site. We usually shun tour guides with our index fingers crossed. In exchange, though, we were treated to a fascinating story from a fascinating perspective. Incidentally, the site also has a statue of Joseph Smith, the head of which was based on his death mask and skull. Every New England road trip needs a wild turkey sighting. By this point in the trek, it was getting sunny and warm. I shed my jacket and few tears, and we continued on. From there we hit up Green Mount Cemetery in Montpelier, the capital of Vermont. This is one of my favorite cemeteries in New England. It’s best experienced in the Fall on an overcast day (like everything in life, honestly), and so we’ll never get better photos than our first visit there back in 2007 before we were New Englanders. Next on the itinerary was Goddard College in Plainfield. This…didn’t feel like a college. More like a ghost town. And the college does have a strange model where everyone comes in for a few days, and then spends the rest of their matriculation at their homes. I was there to see the campus’s garden house. Rumor has it that it was constructed from the timbers of the courthouse where Susannah Martin, one of the Salem Witch Trial victims, was imprisoned. It was a gesture of spite by her descendants. Even if the peaceful little building didn’t have such a story stuck in its rafters, the Goddard College garden house and gardens are a small, bright jewel worth visiting. I was surprised by how satisfying this site was. After that, we only had one more site to go, in St. Alban’s. The fastest way from Plainfield to St. Albans is by Route 89 to Lake Champlain and then up the coast past Burlington. We decided to take a more meandering path, though, through Smuggler’s Notch, and were rewarded with quaint towns and giant boulders blocking half the road and green ski trails shaved down mountain flanks and every other element of road trip perfection. It also meant that right around Stowe, we got hungry for lunch. So we randomly stopped at the Von Trapp Brewery. I won’t get too deep into this place, but in Stowe is a resort started by the Nazi-ducking family that The Sound of Music was based on. The resort and the brewery are Austrian-themed, which meant this brewery was more a biergarten and our lunch was bratwursts and Oktoberfest beer. I’ve already mentioned before in this die-ary that I don’t like beer. But I definitely will have one if it means keeping a theme intact. And then we arrived at our final destination before the U-turn home. It was in a forest at the top of a ski slope and involved the final stand of a 19th century gray wolf. I’m not getting too descriptive about these oddities because they deserve to be full OTIS fodder at some point, but this last one, I’m going to hold back on even more because I shot video there, and if it comes out, I’ll post it this Halloween season. I walked up a ski slope. I'll feel the side-effects of this until my eighties. The only flaw in our entire trip was the lack of changing foliage. Every once in a while we saw a branch or two in full orange and while in Green Mount Cemetery a single yellow leaf drifted to the ground at our feet, but otherwise the Green Mountain State lived up to its name. Here’s our quandary when it comes to foliage trips, at least here in new England. The color change normally starts in the northern areas of the region sometime around early October…and in October we’re usually focused more on Halloween events and activities than road trips. Add to that, southern New England, which we are arguably at the tippy top of, doesn’t even really hit peak until like November. So timing a road trip hereabouts is tricky. And it’s especially so for my family this year, because come October, we can’t stray too far from home because we have our catcher’s mitts on, awaiting the prophesied arrival of the new baby…Sam Hain Ocker. But who cares about the color of our backdrop on this road trip? The whole thing was a flawless victory. 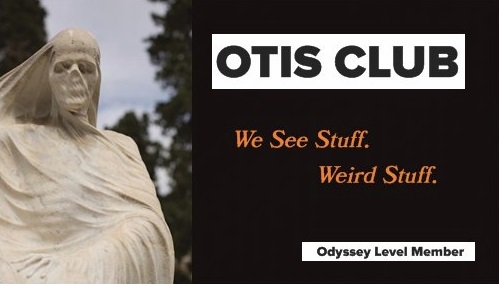 By the way, I’ll be putting a bunch of bonus photos from this trip in this week’s OTIS Club Newsletter Thing, so if you’re interested, it’s a good time to join the club. Inside the Goddard College garden house.